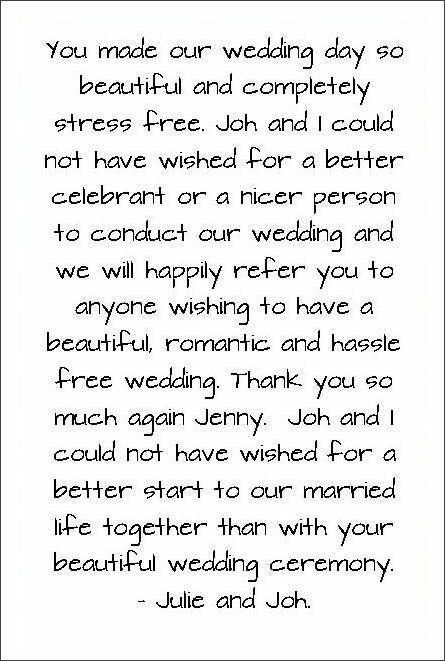 It is important, both legally and for the enjoyment and engagement of your guests, that your ceremony is heard by everyone present. And that includes your voices when you say your vows, as well as your celebrant's voice throughout the ceremony. For most weddings, this means that you need amplification, a PA system of some sort, which of course, involves microphones. Microphones bring their own benefits, and challenges, so the type of microphone (as well as the quality of it) is important. If you look at photos of weddings you will come to the conclusion that most celebrants don't use hand-gestures because they've got a book, card, or tablet in one hand, and a microphone in the other. In fact, using a hand-held mike is a pretty strong signal that all the celebrant is going to do in your ceremony is talk. 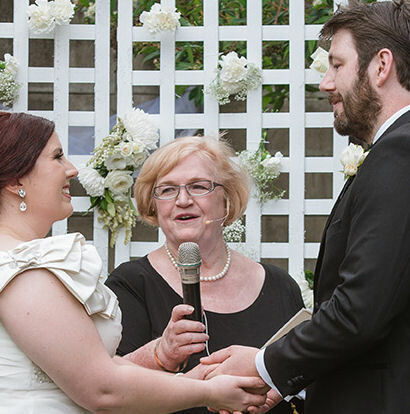 Some celebrants claim that they don't use a headset or a lapel mike for themselves (a hand-held is required for your vows) because only a hand-held can produce top quality sound. With a lapel mike they do have a point. You have to keep your head pretty still. So if you're like me, wanting to engage with the couple and with the guests, you need to be able to move your head from side to side, which makes the sound cut out or go soft and loud depending on where your head is in relation to the mike. But the claim that a headset microphone is a poor substitute for a hand-held microphone is patently false. If it was even partly true head-set microphones wouldn't be seen on stage performers as they routinely are - even for opera performances. So I'll let you into a little secret. It is not about the sound. It's about the hair! (though often it is just simply that the PA system has been provided by the venue). However, for your vows, the best, and simplest option may well be a handheld wireless microphone. And understand that a microphone can only amplify a sound, not create one, so speak loudly! PS: If you are having a professional videographer, ask how you will be wired up? Generally speaking, videographers I have worked with will either ask to plug into my PA (which means your video sound is only as good the sound from the PA) or they will mike up the groom using a lapel mike (aka a lavalier). Wiring up the bride has some unique challenges, but modern technology can overcome that, with the belt-pack attached to your thigh.